Cuboidal cracking of the wood, fruiting bodies, White fluffy cotton wool-like growth, thick tubular-like growth. As in all rot problems the cause is due to moisture in the wood either from a leak or timbers being in contact with damp masonry, once the wood becomes damp this is all that’s needed (food and water) for the spores to germinate and start attacking the timber and walls around the source. 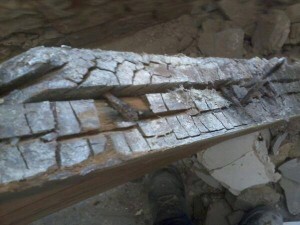 The primary and most important aspect of treating dry rot is to eradicate the source of moisture in the wood, the source can come from a leak which must be stopped before any treatment can commence, or from the wood being in contact with damp masonry. Once the source has been eliminated all effected timbers and plaster must be removed up to a maximum of 1 meter past the last signs of rot. The walls must then be chemically irrigated and specialist re-plastered, when all walls and plates have been treated joists and boards can be replaced with tanalised pre-treated timber. Unlike dry rot there are many different types of wet rot, so its not always easy to distinguish which type of fungi is causing the problem. 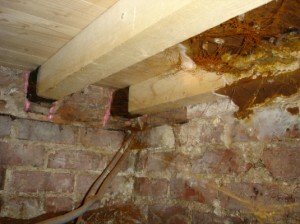 But fortunately the treatment for all wet rots are usually the same and far less difficult to control than dry rot. The wood breaking down into very coarse fibres, slightly bleached in colour, tufts of the tawny coloured mycelium can be seen in the cracks of the decaying wood, fruiting bodies can appear but less likely as in dry rot. As in all rots the cause is due to moisture in the wood, in wet rots usually the wood is in contact with damp masonry, thus rotting skirting boards are usually the first signs. 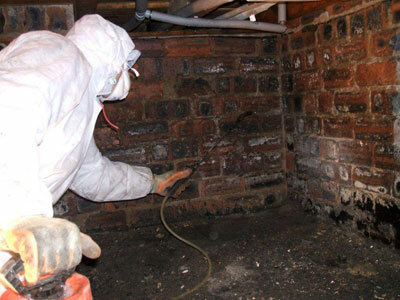 With all rots the primary treatment is to eliminate the source of moisture, this will usually start with the removal of all rotten wood and damp masonry followed by specialist re plastering, and depending on the source of the problem, a DPC injection to the walls in question may be required. Replacing all joists and boards with tanalised timber making sure when fitting they do not come into contact with any wet masonry. The treatment is finished with a chemical spray to remaining timbers under threat. 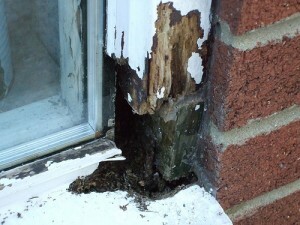 There are many types of wood boring beetle, but all cause the same problem if left untreated. The usual sign that wood is suffering from woodworm is the formation of bore holes, these holes indicate that the wood is either under attack from the beetles or has previously been the subject of an outbreak. Once it has been established that the beetles are active(and this is not always the case) all rotten wood should be removed and replaced with pre-treated timber, all remaining sound wood will them receive a chemical insecticide spray.